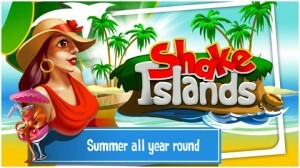 Shake Islands is an iPhone game developed by fudog.org/Alexey Naumov. 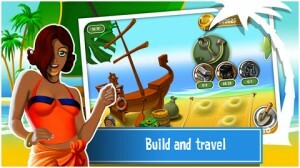 In this gorgeous little game, you must gather resources and make your way across a chain of beautiful islands. This game is jam-packed with stuff to do. In between serving juice drinks to the natives and planting exotic flora in your gardens, you can gather materials to build a ship and travel to new and exciting islands. The juice drink bar you tend is somewhat similar to the mechanics found in games like BarOasis. Instead of tipping your phone to pour a drink, however, you merely touch an ingredient and watch as it fills your kettle to a certain level. While some of the in-game text is awkwardly phrased and grammatically incorrect, the overall experience is fairly amusing. The interface can occasionally be confusing, but it’s easy to get the hang out fairly quickly. Players are most likely to enjoy the character designs, which include several scantily-clad island ladies. If you like your games with a side of eye candy, the eye candy here is arguably the best part of this game. 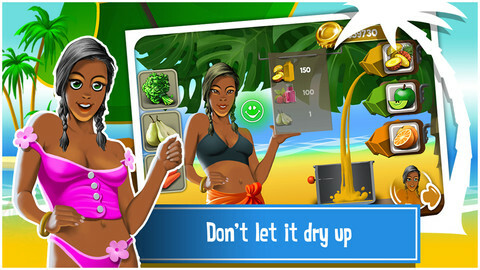 Boasting gorgeous graphics and an interesting set of game mechanics, Shake Islands gets a score of 7.5 out of 10. The game is good, but it does have a few issues here and there. Overall, the game feels a bit uneven…but for some players, the existence of pretty island girls is enough to erase this game’s few flaws from memory. If you need an island mini-break, this is cheaper than a flight to Fiji! Shake Islandsis compatible with iPhone 3GS, iPhone 4, iPhone 4S, iPhone 5, iPod touch (3rd generation), iPod touch (4th generation), iPod touch (5th generation) and iPad. Requires iOS 5.0 or later. This app is optimized for iPhone 5.